What are the steps to restart the service? You can open up command prompt as admin and run a "net stop <servicename>"
you can do a "net start" to see what is currently running. You can also just reboot and it should start the service again. Not sure why you got that error, maybe lack of internet connection or something like that. Hi Wookiee, that's something good & useful to know! I knew the command prompts for version 5 to stop & re-start Immunet without re-booting (which were net stop immunetprotect & net start immunetprotect) but those prompts had changed with version 6 and I was never informed what the new prompts were, until now anyway! Also, if a user wishes to use these command prompts to completely disable Immunet one needs to kill iptray.exe first by right-clicking on the Immunet tray icon and selecting Hide Tray Icon, then use the stop command. Then when the start command prompt is used to launch sfc.exe one simply needs to do is click on the Immunet Desktop or All Programs icon to launch iptray.exe again. There have been times when being able to completely disable Immunet was important. Like when it comes time to upgrade my other AV to a new version being pushed through the UI. 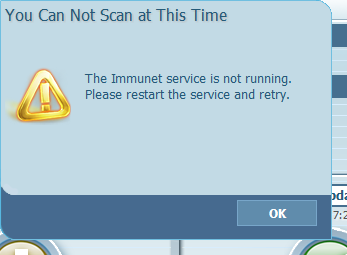 Immunet would always interfere with this upgrade process for Panda AV (now called Panda Dome) when the RarSFX upgrade files would get flagged & quarantined if Immunet was still running. also, make sure you run the commands as an admin. Or, it won't work.